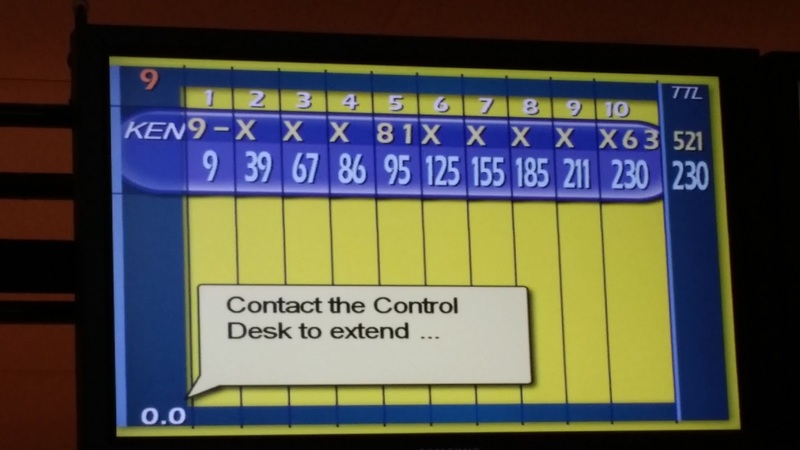 This was something of a down day. I slept in a bit and the big event of the day was going out to The Ponds at Lakefront, a disc golf course which was built on the remnants of an old ball golf course. It was flaaaaaaat and a great place to practice throwing for distance and I spent about three hours on the course. The only really tricky shot was one over an old pond and that was only if you threw from the pro tee. It was a tunnel shot between trees on both banks and about 100' of lake between. I was playing the regular person tees so I had a much easier shot over a dried out finger of the pond (in fact, I overshot the basket). I got a lot of practice throwing long shots (for me) and I wish there was some place around home which I could go to and use like this place to practice bombing discs; it's possible I could develop a decent distance throw if there was. On the other hand, since most of the places back home require more control than distance I think the kind of throws which I was using yesterday might lead to me smashing my discs into a lot of trees when I get home. Anyway, post disc golf I found another Arabic restaurant to eat at, but it wasn't quite as good as the one I went to Sunday night. 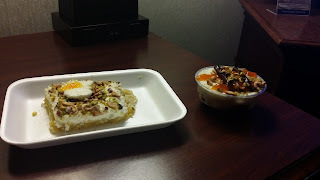 Then I went back to Masri Sweets and bought more stuff I ought not to be eating. After that I wandered around Dearborn rubbernecking like all tourists do. It's interesting. 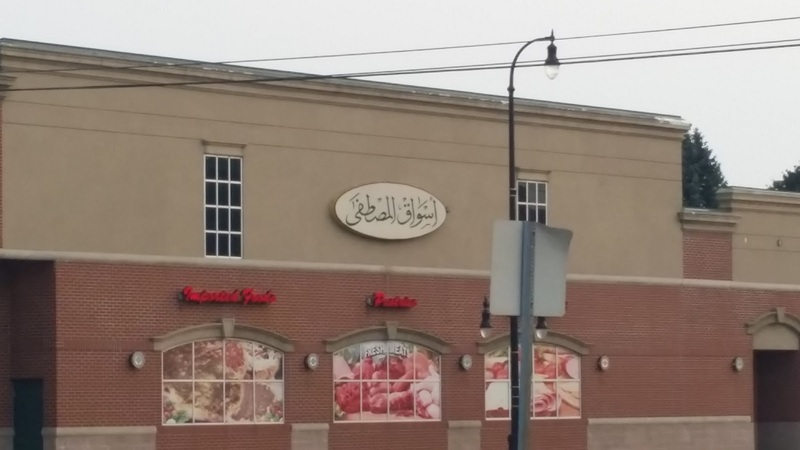 You drive around and see a few signs with both English and Arabic on them and then suddenly you're in a roughly 6 block area where everything has both. There were only a couple stores I saw which only had an Arabic sign and both of them seemed to be women's clothing stores. 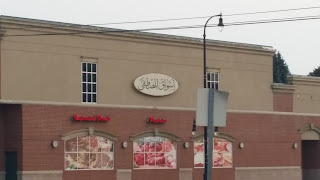 There seem to be a lot of restaurants proclaiming in Arabic that they are Lebanese while just saying "Arabic" for us poor gringos who la narifoo al-luga. Another interesting thing to see was the abundance of hooka stores and hooka bars. Didn't stop at any as I am not a fan, but it looked a lot like it filled the slot that bars would in most places. Not that there weren't also a fair number of bars around, because there is also obviously a non-Arabic population here as well. And that brings me to my final topic of the day. There are an awful lot of yankees up here. I mean, I expected there would be people of Arabic descent, but nobody warned me about the huge numbers of yankees with weird accents and courtesy disabilities. Of course, once you make the 20-30% rudeness allowance that you have to make for yankees in general they are all perfectly decent human beings. There are just so many of them. I've even run into a few of a truly different group of people from some place north of yankeedom which I think is called "Canadia." These people are very polite, pronounce their "o"'s very differently (omg, it's not just a stereotype), and talk about something called "hawk-key" even while they are sitting at a baseball game. Anyway, next comes the Lansing Lugnuts game. See y'all at the game. Apparently, I pre-paid for parking when I bought my ticket to watch the Detroit Tigers, but forgot about it. I pulled into the first parking lot I found and paid $10. This was lot P. It was maybe half a mile from the stadium and the parking I'd pre-bought was in lot Y. If P was half a mile out, I fear that Y may have been somewhere in Outer Mongolia, so the money was probably worth it. I hiked in and had a little trouble getting through the metal detector until we figured out it was the badge in my wallet setting it off - at which point the security guy wanding me down (who I figure was off duty working a second job) gave me a "you're a schmuck" grin and announced to the guy running the metal detector that I was okay, "It was just the big metal badge he's got in his wallet." And thus, I got passed in. Comerica Park felt like one of those old time monstrocities which were built in the 70's, but apparently it was actually opened in 2000. That's disappointing, especially since I've been to Great American in Cincy (opened in 2003) and seen how much better a modern ballpark can be. Heck, I've been to to the home ballparks of the Charlotte Knights and Norfolk Tides (both AAA) and seen how much better a modern ballpark can be. They spent a lot of time and money making the outside of Comerica look cool and putting up statues to make things look good instead of actually making the park work. The facilities are woefully inadequate. Until yesterday, I hadn't stood in line to use a restroom at a baseball stadium since I went to Riverfront as a kid. There was such a lack of space for vendors that a good deal of the concourse was roped off for kiosks. They were placed immediately behind the rear seats of the lower level. A lot of well thought out stadiums now put tables or stand up bars there so that people who buy food can eat and watch the game. The only tables this stadium provided were well away from any possible view of the field. Unlike most stadiums which have monitors in the concourse so you can keep watching the game as you buy food or visit the loo, Comerica had very few and they weren't even turned on. They weren't even piping the radio play-by-play into the concourse. As well, the seating was bad. There was plenty of nosebleed seats (the vast majority of which were empty) and even the lower level seats were poorly laid out. They were neither staggered by row nor "stadium" style so that when the man took his seat in front of mine I could not see the field unless leaned to one side or the other. Most of the game I tried to position myself so that I could see the pitcher throw and the then quickly flick my eyes past the guy's head and see what happened at home plate. I was willing to forgive all this as the faults of a stadium built in the same era as Riverfront (1970) - and boy, did it bring back on deja vu of attending games at Riverfront - until I looked it up just before writing this and saw it is only 15 years old. Unbelievable. Counterpointing all this was a tremendous group of fans. The place was filled with people and this crowd was live. They rooted for their team the entire time and even sat around joking with the rather large contingent of Toronto fans who came to the game.They held out hope for the entire game despite the fact that Toronto had the game in hand after a 6 run sixth. 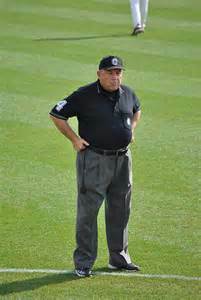 Detroit played sloppy with outfield errors (you catch the ball - no you catch the ball - no you catch the ball - wait, where'd the ball go?) and an easy play with a throw over the first baseman's glove stretched as high as he could get it and still be in contact with the base and more. 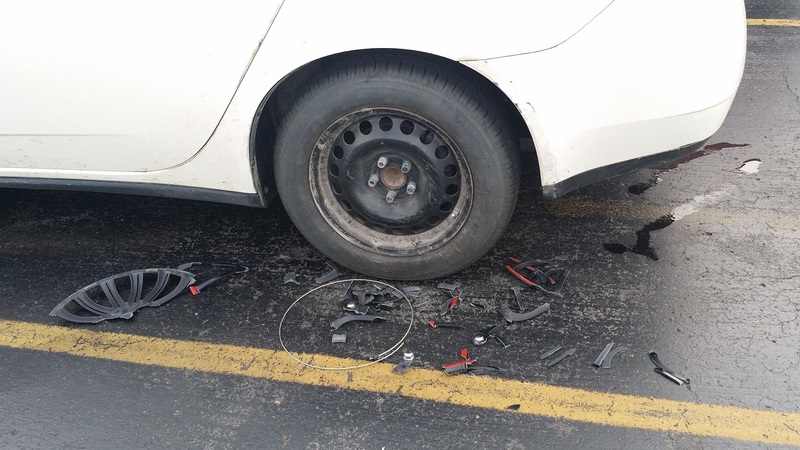 It just wasn't their day. Even so, the crowd held throughout the entire game with very little crowd leakage prior to the game ending. I'm impressed. These are good baseball fans. The funniest part of the day (for me) came when the two guys next to me started griping about how boiling hot it was in the stadium. It was 79 degrees and there was a breeze. I kept my mouth shut, but clearly these people have a different definition of hot than those of us from a little further South. The Tigers lost to the Blue Jays 10-5. Post game, I went to my hotel. It turns out to be an old-fashioned really nice hotel except it is so close to the interstate that you constantly hear the traffic and the outside of the hotel is painted pink. The next step was to find my way to the nearest Arabic restaurant (Al-Ameer) and eat a good meal. Finally, I went to Masri Sweets and got two something or others which each had to have at least 1,000 calories and tasted amazing. And so the day ended on an excellent note. Day Two: I drove to Columbus to watch the Columbus Crew S.C. play the New York Red Bulls. It was the first soccer game I'd gone to since I watched my high school (Bryan Station) get massacred by Lexington Catholic some time back in the stone ages. I was a little surprised when they charged me $15 for parking. That's a little steep, but there was nowhere else to park so I paid it. Next, I had to figure out where the stadium entrance was and get through the rigorous security which required me to pat my pockets before I could enter the park.Then I walked in and the first thing I saw were giant hanging banners in yellow with the pictures of four Crew players painted on them. I felt like I should be pledging loyalty to Rodina and the Party. The stadium itself felt like a super-sized high school stadium. The whole place is made of metal bleachers. The only pro level stadiums where I've seen that before is single A baseball and even then rarely. The place just did not feel permanent. And then there was the crowd. At most sporting events I've been to the crowd seems to take on a life of its own. There's a constant buzz even before the game in the concourse area. In contrast, this group of people came in like a bunch of zombies. They looked like loyal fans, although a huge number of them were wearing the old cool logo instead of the new generic. They just did not seem excited at all. 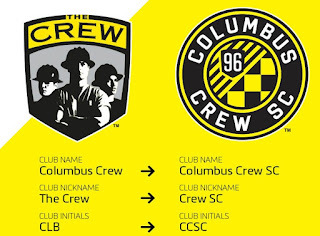 And then they changed to a generic, designed by committee logo which I could have doodled in my spare time when I was in the 7th grade. 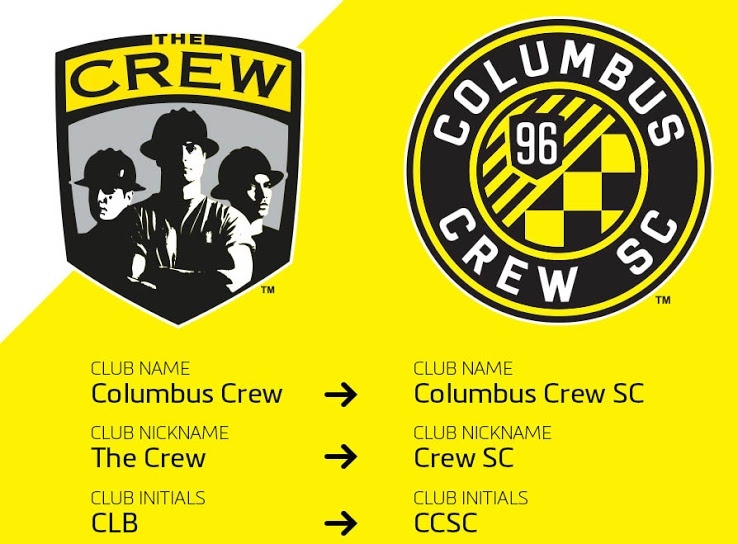 They also decided that hereafter and for all time they would change from being called "the Crew" to being called "Crew SC" The SC stands for soccer club because I guess we weren't smart enough to figure out what sport those guys running around on the pitch were playing. It was one of the worst guttings and generitizations that any sports club has gone through. 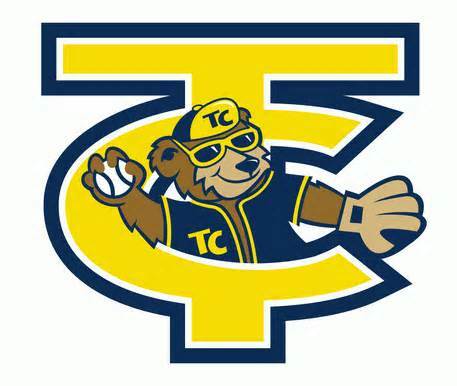 If you are standing twenty feet away from someone wearing the new logo it just looks a circle with some indecipherable squiggles in it. It was clear by looking at the crowd that they are not buying in. While the new logo was everywhere in the stadium, the majority of the people in the crowd who were the obvious die hard fan types were wearing the old logo. And it's too late in the season for this just to be stuff left over from last year. In fact, most of the t-shirts looked like they were new so somebody is still selling stuff with the good logo on it. This was a monumental screwup on the part of the Crew's owner/management. Will they fix it? No. Will they admit it? No. The new logo is the perfect corporate creation. It is generic enough that it carries no real meaning. Thus it can't really raise any emotional backlash or stir any feelings and you can sell it to everyone. And it feels more European than the old, American-feeling logo and this is a sport where we should all be europhiles, so that's another plus. Once the match started most of the crowd sat there quiescent. There were a lot of empty seats for an organization which brags about how numbers are up. To be fair, that might have been because it was the 4th and many people might not associate soccer with the 4th. Anyway, there was a corner section which was filled with rowdies making lots of noise, but it had little or nothing to do with the match. They were just over there singing songs and chanting away oblivious to the events on the pitch. Eventually, the crowd did start to slowly come to life, but it didn't really happen until about 35 minutes in when the Crew tied the match at 1-1. Even then it seemed to slowly rise out of somnolence until it got about half 75% engaged by the end of the match. I'm not sure the rowdies in the corner ever really engaged, but they made noise the whole night through. The main lesson I learned while at the match is that soccer is not a good sport to watch from the third row, mid-pitch. My seat gave me an okay view except for when it was blocked by the TV camera which the Crew placed right on the half way line. However, when I left the seat at the break between periods and went to the upper level I could actually watch the play far better. It's something I'll have to keep in mind if I ever make the 5 hour journey back up here to watch another match. In the end, the Crew won 2-1. So, vacation was going to start Thursday at noon when the office closed for the 4th of July holiday. As I'm sure all of you know and have experienced, that was just a pipe dream. By the time court was over, I finished what paperwork I could, and left instructions relating to the remaining stuff, it was dusk. Consequently, the trip home to get my bags and feed the critters turned into a decision to remain home. After all, I'm not sure my cat can sleep unless it is laying on top of me. Friday morning I timed my departure so that I could stop at the Pine Mountain Grill in Whitesburg for breakfast. Of course, when I get there the place has a sign on the front door informing customers that because Letcher County is cutting water off at 8 a.m. the resteraunt isn't serving sit down meals until the water is turned back on. So, I end up getting a couple biscuits at the next Double Kwik I ran into on the road. The 5+ hour journey to Dayton, Ohio continued. Through most of the trip I was listening to "They Called Me God: The Best Umpire Who Ever Lived", an audiobook about the life and career of Doug Harvey. As you might suppose from the title, Mr. Harvey is not exactly the most humble guy who ever lived, although it is an interesting ramble through whatever topic seemed to pop into his mind as the book was being written. That's typical of this kind book so I wasn't dissappointed, although I think "The Umpire Strikes Back" by Ron Luciano was better (but it isn't available in audiobook). I got to Dayton early enough to go to the local top ranked disc golf course. You drive through a somewhat run down area of town to get to a somewhat run down park in order to find a run down disc golf course. The course wasn't bad, it just wasn't as good as I'd hoped - lots of medium-long, rather open fairways over grass that was just tall enough to stop the disc from skipping and hide it from easy view. Lots of younger kids playing in groups of three to six. Naturally, I get glommed onto by an older hippy type who just decides he's going to golf with me on the third tee. Admittedly, I didn't try to shake him too hard because he became my native guide. Without him I'd have wasted at least five or ten minutes trying to figure out where each next tee was and where each basket was. Still, I wasn't too surprised at the end when he hit me up for beer money. Next came the Travelodge hotel. Not much you can say about a $50 hotel. The hallway to the room smells funny and some of the people in the other rooms are *ahem* interesting, but the room is solid enough and the lock on the doors and the wifi work great. To this point, Vacation 2015 was rating mediocre to mediocre-low. And then I went to watch the Dayton Dragons play. It's nor fair. 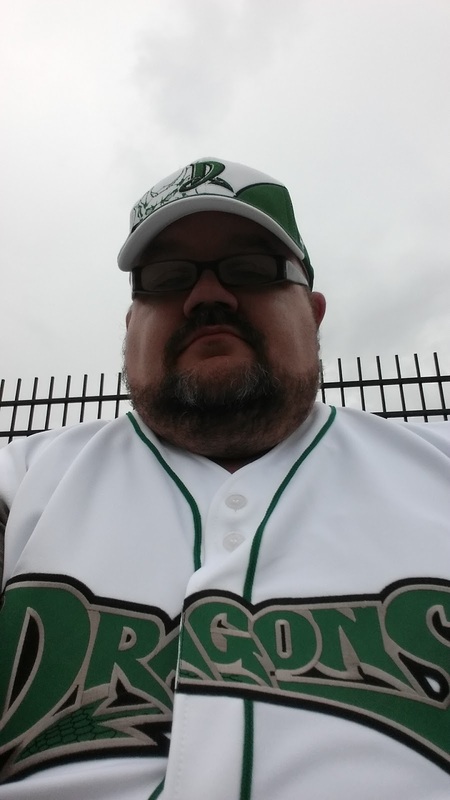 The Dayton Dragons have now set the standard against which the rest of my vacation will be judged. The only tickets I could order for this game were in the outfield grass area (I kid you not) and the area was filled with people. The stands were packed and the place felt more like I was at a well attended AAA game rather than a single-A. As the game began, they were making announcements about how you could try to arrange to get tickets for next year. The scoreboard had big dragons on it. The outfield walls were electronic and constantly playing scenes. The people were really into the game and nobody left before it was over (in most minor league parks there is a trickle after the third and a steady drain of leavers starting about the seventh). Heck, when the game was over I left and the great majority of the crowd was still sitting in its seats. It was amazing. I now want to move to Dayton just so I can rent an apartment across from the field and go to every home game. I even violated one of my major rules and bought a jersey. So, the rest of the baseball teams I'm going to see this next eight days have a lot to live up to. 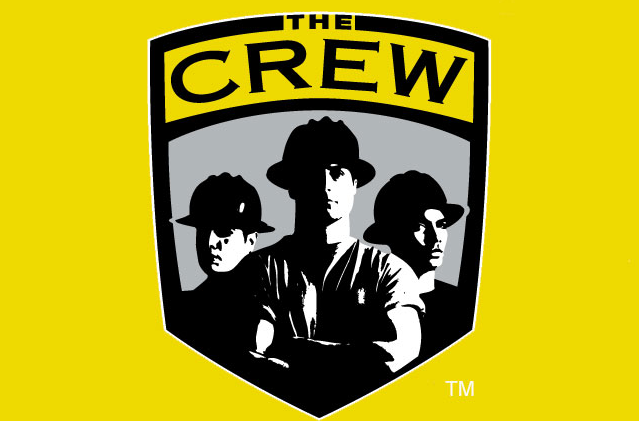 Today is actually a soccer day and I'll drop ya'll a line about the Columbus Crew tomorrow morning.